One man's irreverent and hilarious chronicle of his ambitious but clumsy efforts to tread lightly on the planet. 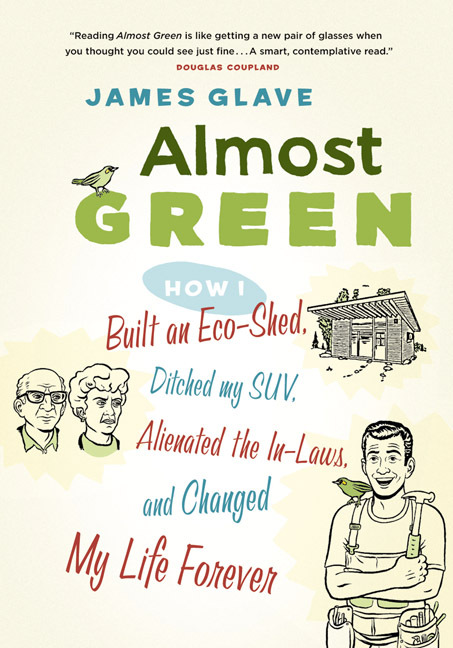 In Almost Green, James Glave demonstrates that the journey along the path to a greener life is not always easy but is frequently hilarious and always enlightening. Glave— a writer and stay-at-home dad — describes his experiences building a green writing studio in the front yard of his home on Bowen Island, British Columbia, a not-so-green paradise where suvs still outnumber compost boxes. While coping with the many frustrations and small victories of this undertaking, Glave also dabbles in grassroots neighborhood activism. He visits a truly green family living in the concrete jungle of the city and decides he must divest himself of his hulking suv, so generously given to him by his father-in-law, without offending his benefactor.